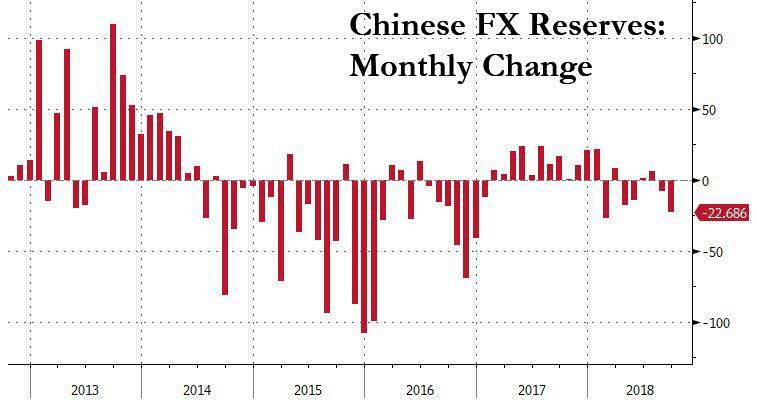 Chinese FX Reserves Drop The Most In 7 Months; Yuan Set To Plunge Below PBOC "Red Line"
At roughly the same time that China announced its latest 1% RRR cut, whose net liquidity injection would be roughly 750BN yuan, the PBOC reported that FX reserves decreased by US$23bn in September to $3.087Tn from $3.110TN after an $8bn drop in August. With consensus expecting a far more modest drop of only $500MM to $3.105TN, this was the biggest drop in Chinese reserves since February; to find a greater outflow one would need to go back all the way to December 2016. Unlike in recent months when the value of the Yuan declined sharply, in September the currency valuation effect was quite modest, and according to Goldman calculations amounted to only -$2bn suggesting that capital outflows have returned, if at a modest pace for the time being. Additionally the rise in US Treasury yields during the month might also have contributed to the reserves' decline: In the official statement, SAFE said the rise in global yields was one factor for the decline in reserves. Based on historical observations, though, it is not clear to what extent reported FX reserve readings take into account asset price changes. As a reminder, the PBOC's FX reserve report is viewed somewhat skeptically by the analyst community, and subsequently released - and more exhaustive - PBOC and SAFE flow data will give further information to gauge the underlying FX flow. China's reserve holdings, the world’s biggest, have so far exhibited modest fluctuations as capital controls remain in place and policy makers have taken measures to stabilize the falling currency. That said, amid a worsening trade-war outlook, negative sentiment around China’s economy and a surging U.S. dollar could yet test the nation’s defenses. "China’s foreign-exchange reserves should decline given a stronger dollar and increasing depreciation pressures on the yuan, which could prompt the PBOC to intervene," said Mizuho FX strategist Ken Cheung. "Also, capital outflows should be increasing due to mounting risks on China-U.S. trade war risks." 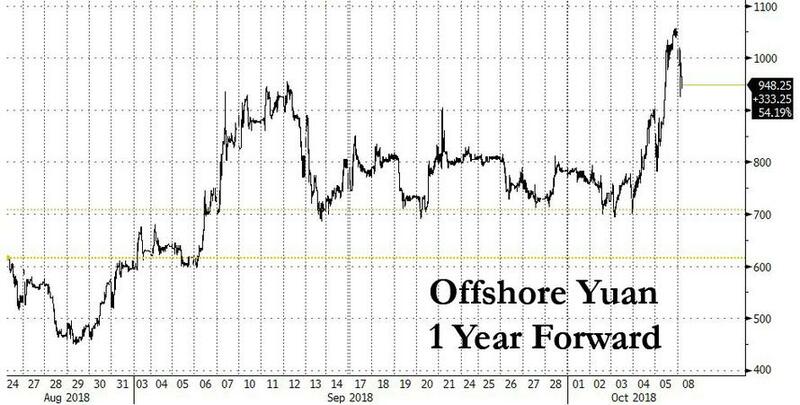 And speaking of the depreciation pressure on the yuan, which today just increased again after the abovementioned required reserve ratio cut, with China returning form a week-long holiday its currency is bracing for renewed trade war - and rate shock - impact, and weakened in offshore trading to a new 7-week low as traders prepared for mainland markets to reopen. The offshore yuan dropped as low at 6.9152, down -0.3%, after falling another 0.3% last week, and was approaching the lowest level since August 16 when it tumbled as low as 6.95 before recouping some losses. The CNH is once again dangerously close to the PBOC's redline of 7.00, with 3-month USD/CNH points, which have reached their highest this year, suggesting that a breach of that level is increasingly probably and implying a CNH yield of around 2% above equivalent USD 3-month rates. At the same time, the 1-year forward is also flirting with 1,000 pips, another signal that traders see a weaker yuan. The rate of appreciation in the forward curve this month is the quickest since June, when the U.S.-China trade war crossed the Rubicon. 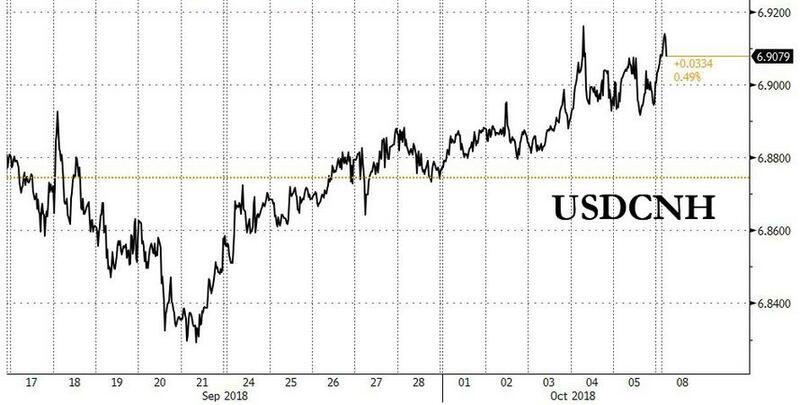 As a reminder, the further the yuan drops the greater the offset to US import tariffs, and the more likely that the Trump administration will impose even greater sanctions in the future as it sees Chinese monetary policy as specifically targeted to undermine the impact of Trump's trade war including manipulating its currency.